As we have experienced too often in the past, the hot and dry summer weather makes North Central Washington increasingly susceptible to wildfires. When we add the threat of lightning strikes or bad individual decisions, wildfires are typically a when-not-if scenario in our region. In recent weeks, we’ve seen wildfires strike in several locations in the 12th Legislative District. 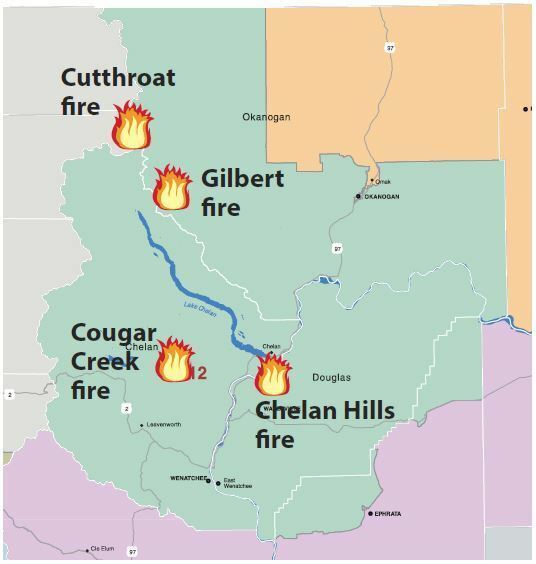 While fortunately not as bad as ones in past years, the current wildfires include the Cougar Creek fire about 20 miles northwest of Entiat, the Chelan Hills fire south of the Beebe Bridge, the Gilbert fire northwest of Twisp, and the Cutthroat fire about 13 miles west of Mazama. Wildfire crews and other first responders are currently engaged in four major fires in NCW. Like so many of you, I’m thankful for the hard work, skill and courage that firefighters show as they battle these blazes. And although the focus is on fire suppression at the moment, I am also appreciative of the increased interest and collaborative efforts to reduce wildfire risk in our state. Click here for the latest on the local wildfire situation from the Wenatchee World, and click here for how the state Department of Natural Resources and its director, Commissioner of Public Lands Hilary Franz, are responding to wildfires statewide. For more, including information on burning restrictions, please visit DNR's Wildfire Resources webpage. You can also visit the Northwest Interagency Coordination Center’s webpage. KPQ’s J. Michael Knight hosted me in studio twice this July. As our state senator, I welcome our radio stations’ interest in interviewing our elected and local government officials. I enjoy the opportunity to help keep listeners updated on what’s happening in the Legislature. 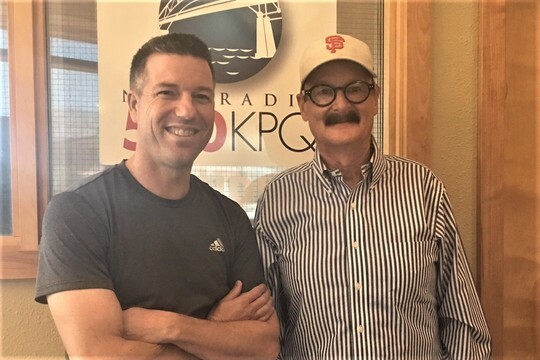 This July, I had the rare opportunity to be both the “interviewee” and “interviewer” with J. Michael Knight, KPQ’s radio personality and host of “The Agenda” show. On July 9, Michael interviewed me in studio, asking me about my years growing up in the Wenatchee Valley, my role as a legislator, what to expect with the 2019 session, and even my favorite music artist! Click here to listen to KPQ’s J. Michael Knight interview me. Michael always does an excellent job of not only putting his guests at ease but also making them the focus of the program. I thought it might be nice for his loyal listeners to get a chance to learn more about him. So as that interview wrapped up, I offered to come back in studio to interview Michael himself. A bit to my surprise, he quickly accepted. Before I knew it, we had a date set on July 24 for us to switch roles. I asked Michael about his background, what the “J.” stands for, how he became interested in radio, and what brought him to Wenatchee. Conducting a live on-air interview is not easy, even though our local radio hosts make it appear so. I mentioned to Michael following the show, both as a laugh but totally serious, that I look forward to “just answering” the questions from now on. We had a great time. Click here to listen to me interview KPQ’s J. Michael Knight. I’m thankful for Washington’s growing economy. A strong economy means more jobs. I’m encouraged by the low unemployment numbers both in Chelan and Douglas counties and statewide. A vibrant economy also means strong state revenue collections through existing taxes, like the sales tax. Strong revenue collections enable the Legislature to not only adopt sound operating budgets, but also to put aside surplus revenue in case of a future dip in the economy. Whenever the state economy slumps, it can mean a significant drop in state revenue, raising the possibility of spending cuts to state services and state employee layoffs. That’s why it was prudent that Washington voters approved the creation of the state’s Budget Stabilization Account (better known as the “Rainy Day Fund”) so extra state revenue collected during strong economic times can automatically be put aside to provide a buffer for the budget when tough economic times arise. Recent state revenue forecasts have been very positive but, as we look ahead, the state should continue to focus on creating and passing responsible budgets, investing taxpayer dollars wisely, and build our budget reserves so important state services and programs are better insulated against any cooling of the state’s economy. I appreciate the opportunity to serve as our state senator and wish you and your families a safe and happy August.